To commemorate those Anzacs who died and suffered from their wounds as a result of the 1914-18 war, we have been allocated a small part of Federal Government grant funding to cover materials and expenses for a series of exhibitions for the Anzac Centenary Year. The application went in May 2014, a letter of approval, dated Dec. was received in Feb. 2015. The funds were transferred on 24 April, only one day before Anzac Day! Following his highlighting of 4HR's work in NSW Parliament last year, Chris Holstein, Member for Gosford, views some of our latest work. Funding to cover expenses for building an historic working model of a unique Australian inclined railway at the West Head Battery. Funding announced from Federal Anzac Centenary Grant, to cover materials for building a number of exhibition subjects relating to WWI. …. 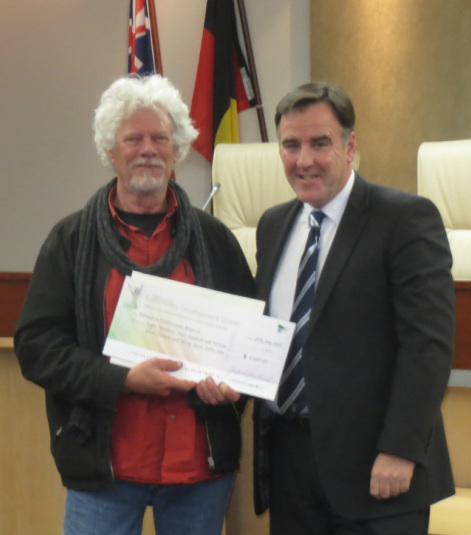 "EXHIBITION WILL REMAIN AVAILABLE AS A VALUABLE TEACHING AID"
Mayor Lawrie McKinna presented 4HR with a Gosford City Council Community Development Grant for this project. The grant application was supported by the Community Environment Network. The funds will cover materials and expenses to build a number of model dioramas, to depict Australians during WWI, particularly focusing on those from the Central Coast. Specially prepared graphics and historic photos will enhance the models in the multi media work, due for unveiling on Anzac Day 2015. Following this showing the exhibition will travel throughout the region via an enclosed trailer which has been donated. Following the initial 2015 display period the exhibition will remain available as a valuable teaching aid.